For other uses, see Deism (disambiguation). Not to be confused with theism. Deism (/ˈdiːɪzəm/ DEE-iz-əm  or /ˈdeɪ.ɪzəm/ DAY-iz-əm; derived from Latin "deus" meaning "god") is the philosophical belief which posits that although God exists as the uncaused First Cause – ultimately responsible for the creation of the universe – God does not interact directly with that subsequently created world. Equivalently, deism can also be defined as the view which asserts God's existence as the cause of all things, and admits its perfection (and usually the existence of natural law and Providence) but rejects divine revelation or direct intervention of God in the universe by miracles. It also rejects revelation as a source of religious knowledge and asserts that reason and observation of the natural world are sufficient to determine the existence of a single creator or absolute principle of the universe. Deism as a form of natural theology gained prominence among intellectuals during the Age of Enlightenment, especially in Britain, France, Germany, and the United States. Typically, deists had been raised as Christians and believed in one God, but had become disenchanted with organized religion and orthodox teachings such as the Trinity, Biblical inerrancy, and the supernatural interpretation of events, such as miracles. Included in those influenced by its ideas were leaders of the American and French Revolutions. Deism is considered to exist in the classical and modern forms, where the classical view takes what is called a "cold" approach by asserting the non-intervention of a deity in the natural behavior of the created universe, while the modern deist formulation can be either "warm" (citing an involved deity) or "cold" (citing an uninvolved deity). These lead to many subdivisions of modern deism, which serves as an overall category of belief. Deism is a theological theory concerning the relationship between a creator and the natural world. Deistic viewpoints emerged during the scientific revolution of 17th-century Europe and came to exert a powerful influence during the 18th-century Enlightenment. Deism stood between the narrow dogmatism of the period and skepticism. Though deists rejected atheism, they often were called "atheists" by more traditional theists. There were a number of different forms in the 17th and 18th centuries. In England, deists included a range of people from anti-Christian to non-Christian theists. For deists, human beings can know God only via reason and the observation of nature, but not by revelation or by supernatural manifestations (such as miracles) – phenomena which deists regard with caution if not skepticism. Deism is related to naturalism because it credits the formation of life and the universe to a higher power, using only natural processes. The classical deism of the 17th and 18th centuries is a form of natural theology and denies that that power has any continuing involvement with the world. Modern deism may also include a spiritual element, involving experiences of God and nature. The words deism and theism, originally synonyms in English, both derive from words for "god": the former from Latin deus, the latter from Greek theos (θεός). By the 17th century the English terms were starting to diverge, with deism referring to the new form of belief. The term deist first appeared in its new sense in Robert Burton's The Anatomy of Melancholy (1621). Deism is usually thought of as having taken root first in England and subsequently spread to mainland Europe. But the term déiste appears in French, in the new sense, as early as 1564. Pierre Viret, a Swiss Calvinist, wrote of deism as a heretical development from Italian Renaissance naturalism, resulting from misuse of the liberty conferred by the Reformation to criticise idolatry and superstition. Lord Herbert of Cherbury (1583–1648) is considered the "father of English deism", and his book De Veritate (1624) the first major statement of deism. Deism flourished in England between 1690 and 1740, at which time Matthew Tindal's Christianity as Old as the Creation (1730), also called "The Deist's Bible," gained much attention. Later deism spread to France (notably through the work of Voltaire), to Germany, and to North America. God exists and created the universe. God gave humans the ability to reason. Most regarded themselves as Christians (though many of their orthodox opponents accused them inaccurately of atheism). Rejection of religion based on books claiming to contain the revealed word of God. Skepticism of reports of miracles, prophecies and religious "mysteries". Most, at least, rejected the doctrine of the Trinity. Some deists rejected the claim of Jesus' divinity but continued to hold him in high regard as a moral teacher, a position known as Christian deism, exemplified by Thomas Jefferson's famous Jefferson Bible and Matthew Tindal's Christianity as Old as the Creation. According to the deists reason provides all the information needed, and they attempted to use it as a critical tool for exposing and rejecting what they saw as nonsense. Some deists used the cosmological argument for the existence of God - as did Thomas Hobbes in several of his writings. A central theme of deist thinking was that the religions of their day were corruptions of an original, pure, natural religion, simple and rational: subsequently corrupted by "priests" manipulating it for personal gain and for the class interests of the priesthood in general, and thus encrusted with superstitions and "mysteries" – irrational theological doctrines. They referred to this manipulation of religious doctrine as "priestcraft," an intensely derogatory term. They declared that laymen were thus kept dependent on the priesthood for information about the requirements for salvation, and baffled by these "mysteries" – giving the priesthood a position of great power, which they worked to maintain and increase. Deists saw it as their mission to strip away "priestcraft" and "mysteries". Tindal, perhaps the most prominent deist writer, claimed that this was the proper original role of the Christian Church. A clear implication of this deist creation myth was that primitive societies, or societies that existed in the distant past, should have religious beliefs less encrusted with superstitions and closer to those of natural theology. This position gradually became less plausible as thinkers such as David Hume began studying the natural history of religion and suggesting that the origins of religion lay not in reason but in the emotions, specifically fear of the unknown. Enlightenment thinkers, under the influence of Newtonian science, tended to view the universe as a vast machine, created and set in motion by a creator being, that continues to operate according to natural law, without any divine intervention. This view naturally led to what was then usually called necessitarianism (the modern term is determinism): the view that everything in the universe – including human behavior – is completely causally determined by antecedent circumstances and natural law. (See, for example, La Mettrie's L'Homme machine.) As a consequence, debates about freedom versus "necessity" were a regular feature of Enlightenment religious and philosophical discussions. Because of their high regard for natural law and for the idea of a universe without miracles, deists were especially susceptible to the temptations of determinism. Reflecting the intellectual climate of the time, there were differences among deists about freedom and determinism. Some, such as Anthony Collins, actually were necessitarians. Deists hold a variety of beliefs about the soul. The noted deist authors declare a range of beliefs. Anthony Collins, Bolingbroke, Thomas Chubb, and Peter Annet were materialists and either denied or doubted the immortality of the soul. Benjamin Franklin believed in reincarnation or resurrection. Lord Herbert of Cherbury and William Wollaston, held that souls exist, survive death, and in the afterlife are rewarded or punished by God for their behavior in life. Thomas Paine declared very specific beliefs about the immortality of the soul. Deistic thinking has existed since ancient times. Among the Ancient Greeks, Heraclitus conceived of a logos, a supreme rational principle, and said the wisdom "by which all things are steered through all things" was "both willing and unwilling to be called Zeus (God)." Plato envisaged God as a Demiurge or 'craftsman'. Outside ancient Greece many other cultures have expressed views that resemble deism in some respects. However, the word "deism", as it is understood today, is generally used to refer to the movement toward natural theology or freethinking that occurred in 17th-century Europe, and specifically in Britain. Natural theology is a facet of the revolution in world view that occurred in Europe in the 17th century. To understand the background to that revolution is also to understand the background of deism. Several cultural movements of the time contributed to the movement. Confucius, Philosopher of the Chinese, or, Chinese Knowledge Explained in Latin, published by a team of Jesuit missionaries at Paris in 1687. The humanist tradition of the Renaissance included a revival of interest in Europe's classical past in ancient Greece and Rome. The veneration of that classical past, particularly pre-Christian Rome, the new availability of Greek philosophical works, and the successes of humanism and natural science, along with the fragmentation of Christianity and an increased understanding of other faiths, all helped erode the image of the Catholic Church as the unique source of wisdom, destined to dominate the whole world. In addition, study of classical documents led to the realization that some historical documents are less reliable than others, leading to the beginnings of biblical criticism. In particular, scholars working on biblical manuscripts began to develop the principles of textual criticism and a view of the New Testament as the product of a particular historical period different from their own. Alongside diversity in the past, Europeans discovered diversity in the present. The voyages of discovery of the 16th and 17th centuries acquainted Europeans with new and different cultures in the Americas, in Asia, and in the Pacific. They discovered cultural diversity on a scale never imagined, and the question arose of how this vast range of human diversity could be compatible with the biblical account of Noah's descendants. In particular, the ideas of Confucius, translated into European languages by Jesuit missionaries like Michele Ruggieri, Philippe Couplet, and François Noël, are thought to have had considerable influence on the deists and other philosophical groups of the Enlightenment who were interested by the integration of the system of morality of Confucius into Christianity. In particular, cultural diversity with respect to religious beliefs could no longer be ignored. Europe had been plagued by sectarian conflicts and religious wars since the beginning of the Reformation. In 1642, when Lord Herbert of Cherbury's De Veritate was published, the Thirty Years War had been raging on continental Europe for nearly 25 years. It was an enormously destructive war that (it is estimated) destroyed 15–20% of the population of Germany. At the same time, the English Civil War pitting King against Parliament was just beginning. Such massive violence led to a search for natural religious truths – truths that could be universally accepted, because they had been either "written in the book of Nature" or "engraved on the human mind" by God. The 17th century saw a remarkable advance in scientific knowledge, the scientific revolution. The work of Copernicus, Kepler, and Galileo set aside the old notion that the earth was the center of the universe. These discoveries posed a serious challenge to biblical and religious authorities, Galileo's condemnation for heresy being an example. In consequence the Bible came to be seen as authoritative on matters of faith and morals but no longer authoritative (or meant to be) on science. Isaac Newton's (1642–1727) mathematical explanation of universal gravitation explained the behavior both of objects here on earth and of objects in the heavens in a way that promoted a worldview in which the natural universe is controlled by laws of nature. This, in turn, suggested a theology in which God created the universe, set it in motion controlled by natural law and retired from the scene. The new awareness of the explanatory power of universal natural law also produced a growing skepticism about such religious staples as miracles (violations of natural law) and about religious books that reported them. Edward, Lord Herbert of Cherbury (d. 1648) has been called the "father of English deism". Like his contemporary Descartes, Herbert searched for the foundations of knowledge, and the first two thirds of his book De Veritate (On Truth, as It Is Distinguished from Revelation, the Probable, the Possible, and the False: 1624) are devoted to an exposition of Herbert's theory of knowledge. Herbert distinguished truths obtained through experience, and through reasoning about experience, from innate truths and from revealed truths. Innate truths are imprinted on our minds, and the evidence that they are so imprinted is that they are universally accepted. Herbert's term for universally accepted truths was notitiae communes – Common Notions. There is no general agreement concerning the various rites or mysteries which the priests have devised for the expiation of sin. .. General agreement among religions, the nature of divine goodness, and above all conscience, tell us that our crimes may be washed away by true penitence .. I do not wish to consider here whether any other more appropriate means exists by which the divine justice may be appeased, since I have undertaken in this work only to rely on truths which are .. derived from the evidence of immediate perception and admitted by the whole world. In the realm of religion, Herbert believed that there were five Common Notions. There is one Supreme God. He ought to be worshipped. Virtue and piety are the chief parts of divine worship. Divine goodness doth dispense rewards and punishments both in this life and after it. De Veritate has been described as "the first major statement of deism", but Herbert was convinced of divine intervention, particularly in response to prayer, and this is a clear conflict with its basic ideas. In the years following De Veritate, early works of biblical criticism, such as Thomas Hobbes's Leviathan (1651/ 1668) and Spinoza's Theologico-Political Treatise (1670), as well as works by lesser-known authors such as Richard Simon (1678) and Isaac La Peyrère (1655/1656), paved the way for the development of critical deism. According to Gay, Herbert himself had relatively few followers, and it was not until the 1680s that Herbert found a true successor in Charles Blount (1654–1693). Blount drew on pagan ideas from antiquity to attack Christianity. The publication of John Locke's An Essay Concerning Human Understanding (1689, but dated 1690) marks a major turning point in the history of deism. Since Herbert's De Veritate, innate ideas had been the foundation of deist epistemology. Locke's famous attack on innate ideas in the first book of the Essay effectively destroyed that foundation and replaced it with a theory of knowledge based on experience. Innatist deism was replaced by empiricist deism. Locke himself was not a deist. He believed in both miracles and revelation, and he regarded miracles as the main proof of revelation. After Locke, constructive deism could no longer appeal to innate ideas for justification of its basic tenets such as the existence of God. Instead, under the influence of Locke and Newton, deists turned to natural theology and to arguments based on experience and nature: the cosmological argument and the argument from design. Peter Gay places the zenith of deism "from the end of the 1690s, when the vehement response to John Toland's Christianity not Mysterious (1696) started the deist debate, to the end of the 1740s when the tepid response to Conyers Middleton's Free Inquiry signalled its close." Among the notable figures, he describes Toland and Matthew Tindal as the best known but as talented publicists rather than philosophers or scholars. He regards Middleton and Anthony Collins as contributing more to the substance of debate; in contrast with fringe writers such as Thomas Chubb and Thomas Woolston. Other British deists prominent during the period include William Wollastson, Charles Blount, and Henry St John, 1st Viscount Bolingbroke, and, in the latter part, Peter Annet, Thomas Chubb and Thomas Morgan. Anthony Ashley-Cooper, Third Earl of Shaftesbury was also influential. Though not presenting himself as a deist, he shared many of their key attitudes and is now usually so regarded. Especially noteworthy is Matthew Tindal's Christianity as Old as the Creation (1730), which "became, very soon after its publication, the focal center of the deist controversy. Because almost every argument, quotation, and issue raised for decades can be found here, the work is often termed 'the deist's Bible'." Following Locke's successful attack on innate ideas, Tindal's 'Bible' redefined the foundation of deist epistemology as knowledge based on experience or human reason. This effectively widened the gap between traditional Christians and what he called "Christian Deists", since this new foundation required that "revealed" truth be validated through human reason. Views differ on whether David Hume was a deist, an atheist, or something else. 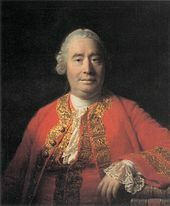 Hume himself was uncomfortable with both terms, and Hume scholar Paul Russell has argued that the best and safest term for Hume's views is irreligion. His writings are sometimes credited with causing or contributing to the decline of deism, but his works on religion lacked influence at the time they were published, and in England deism was already in decline. By the time of his famous Dialogues Concerning Natural Religion (1779) it had almost vanished. His skepticism about miracles makes him a natural ally of deism, but in his Natural History of Religion (1757), he contends that polytheism, not monotheism, was "the first and most ancient religion of mankind" and that the psychological basis of religion is not reason, but fear of the unknown. English deism, in the words of Peter Gay, "travelled well. ... As Deism waned in England, it waxed in France and the German states." France had its own tradition of religious skepticism and natural theology in the works of Montaigne, Bayle, and Montesquieu. 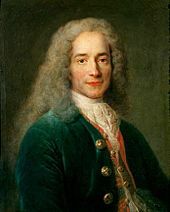 The most famous of the French deists was Voltaire, who acquired a taste for Newtonian science, and reinforcement of deistic inclinations, during a two-year visit to England starting in 1726. French deists also included Maximilien Robespierre and Rousseau. For a short period of time during the French Revolution the Cult of the Supreme Being was the state religion of France. Immanuel Kant's identification with deism is controversial. An argument in favor of Kant as deist is Allen Wood's "Kant's Deism" in P. Rossi and M. Wreen (eds. ), Kant's Philosophy of Religion Reconsidered (Bloomington: Indiana University Press, 1991); an argument against Kant as deist is Stephen Palmquist's "Kant's Theistic Solution". In the United States, Enlightenment philosophy (which itself was heavily inspired by deist ideals) played a major role in creating the principle of religious freedom, expressed in Thomas Jefferson's letters and included in the First Amendment to the United States Constitution. American Founding Fathers, or Framers of the Constitution, who were especially noted for being influenced by such philosophy include Thomas Jefferson, Benjamin Franklin, Cornelius Harnett, Gouverneur Morris, and Hugh Williamson. Their political speeches show distinct deistic influence. Other notable Founding Fathers may have been more directly deist. These include James Madison, possibly Alexander Hamilton, Ethan Allen, and Thomas Paine (who published The Age of Reason, a treatise that helped to popularize deism throughout the United States and Europe). Unlike the many deist tracts aimed at an educated elite, Paine's treatise explicitly appealed to ordinary people, using direct language familiar to the laboring classes. How widespread deism was among ordinary people in the United States is a matter of continued debate. A major contributor was Elihu Palmer (1764–1806), who wrote the "Bible" of American deism in his Principles of Nature (1801) and attempted to organize deism by forming the "Deistical Society of New York" and other deistic societies from Maine to Georgia. Some books against Deism fell into my hands; they were said to be the substance of sermons preached at Boyle's lectures. It happened that they wrought an effect on me quite contrary to what was intended by them; for the arguments of the Deists, which were quoted to be refuted, appeared to me much stronger than the refutations; in short, I soon became a thorough Deist. My arguments perverted some others, particularly Collins and Ralph; but each of them having afterwards wrong'd me greatly without the least compunction, and recollecting Keith's conduct towards me (who was another freethinker) and my own towards Vernon and Miss Read, which at times gave me great trouble, I began to suspect that this doctrine, tho' it might be true, was not very useful. Franklin also wrote that, "The Deity sometimes interferes by his particular Providence, and sets aside the Events which would otherwise have been produc'd in the Course of Nature, or by the Free Agency of Man." He later stated, in the Constitutional Convention, that "the longer I live, the more convincing proofs I see of this truth -- that God governs in the affairs of men." For his part, Thomas Jefferson is perhaps one of the Founding Fathers with the most outspoken of deist tendencies, though he is not known to have called himself a deist, generally referring to himself as a Unitarian. In particular, his treatment of the Biblical gospels, which he titled The Life and Morals of Jesus of Nazareth, but subsequently became more commonly known as the Jefferson Bible, exhibits a strong deist tendency of stripping away all supernatural and dogmatic references from the Christ story. However, Frazer, following the lead of Sydney Ahlstrom, characterizes Jefferson as not a Deist but a "theistic rationalist", because Jefferson believed in God's continuing activity in human affairs. Frazer cites Jefferson's Notes on the State of Virginia, where he wrote, "I tremble" at the thought that "God is just," and he warned of eventual "supernatural influence" to abolish the scourge of slavery. Deism is generally considered to have declined as an influential school of thought by around 1800, but has experienced an extraordinary resurgence in the early 21st century as its simple science- and reason-based philosophy has been rediscovered in the Internet Age. frustration with the determinism implicit in "This is the best of all possible worlds"
spread of deist influence to other schools of thought and associated decline in the use of the term "Deism". Gay has described classical deism as entering slow final decline, as a recognisable movement, in the 1730s. Instead, deism evolved into, and contributed to, other religious movements. The term deist largely fell into disuse; deist beliefs, ideas, and influences lived on. They can be seen in 19th-century liberal British theology and in the rise of Unitarianism, which adopted many of deism's beliefs and ideas. Contemporary deism attempts to integrate classical deism with modern philosophy and the current state of scientific knowledge. This attempt has produced a wide variety of personal beliefs under the broad classification of belief of "deism." Classical deism held that a human's relationship with God was impersonal: God created the world and set it in motion but does not actively intervene in individual human affairs but rather through divine providence. What this means is that God will give humanity such things as reason and compassion but this applies to all and not to individual intervention. Some modern deists[who?] have modified this classical view and believe that humanity's relationship with God is transpersonal, which means that God transcends the personal/impersonal duality and moves beyond such human terms. Also, this means that it makes no sense to state that God intervenes or does not intervene, as that is a human characteristic that God does not contain. Modern deists believe that they must continue what the classical deists started and continue to use modern human knowledge to come to understand God, which in turn is why a human-like God that can lead to numerous contradictions and inconsistencies is no longer believed in and has been replaced with a much more abstract conception. Deism is the recognition of a universal creative force greater than that demonstrated by mankind, supported by personal observation of laws and designs in nature and the universe, perpetuated and validated by the innate ability of human reason coupled with the rejection of claims made by individuals and organized religions of having received special divine revelation. Because deism asserts the existence of God without accepting claims of divine revelation, it appeals to people from both ends of the religious spectrum. Antony Flew, for example, was a convert from atheism, and Raymond Fontaine was a Roman Catholic priest for over 20 years before converting. The 2001 American Religious Identification Survey (ARIS), which involved 50,000 participants, reported that the number of participants in the survey identifying themselves as deists grew at the rate of 717 percent between 1990 and 2001. If this were generalized to the US population as a whole, it would make deism the fastest-growing religious classification in the US for that period, with the reported total of 49,000 self-identified adherents representing about 0.02% of the US population at the time. As of the time of the 2008 ARIS survey, 12 percent (38 million) of the American population were classified as deists. In 1993, Bob Johnson established the first deist organization since the days of Thomas Paine and Elihu Palmer with the World Union of Deists. The WUD offered the monthly paper publication THINK! Currently the WUD offers two online deist publications, THINKonline! and Deistic Thought & Action! As well as using the internet for spreading the deist message, the WUD is also conducting a direct mail campaign. In 1996 the first web site dedicated to deism, deism.com, was launched by the World Union of Deists. In 1998, Sullivan-County.com was originally the Virginia/Tennessee affiliate of WUD and the second deism site on the web. It split from deism.com to promote more traditional and historical deist beliefs and history. The Positive Deism movement began in 2004. Historically and to the present day, deists have been very critical of the revealed religions as well as trying to be constructive. Positive Deists focus their efforts solely on being constructive and avoid criticism of other faiths. In 2009 Chuck Clendenen, one of its adherents, published a book entitled "Deist: so that's what I am!". The aim of the book was to educate those who believed similarly, but did not know the words deism and deist, that there is a name for their belief. In 2009, the World Union of Deists published a book on deism, Deism: A Revolution in Religion, A Revolution in You written by its founder and director, Bob Johnson. This book focuses on what deism has to offer both individuals and society. In 2010 the WUD published the book An Answer to C.S. Lewis' Mere Christianity, which is a rebuttal to the book Mere Christianity by the Christian apologist C.S. Lewis. In 2014, the WUD published its third book, God Gave Us Reason, Not Religion, which describes the difference between God and religion, and promotes innate reason as God's greatest gift to humanity, other than life itself. It proposes that people can have belief in The Supreme Intelligence/God that is beyond a reasonable doubt. The World Union of Deists in 2016 became a producer of the film adaptation of Ian Ruskin's play To Begin the World Over Again: The Life of Thomas Paine. The film includes important coverage of Thomas Paine's profound Deism and his work to promote Deism. In 2010, the Church of Deism (not affiliated with the World Union of Deists) was formed in an effort to extend the legal rights and privileges of more traditional religions to Deists while maintaining an absence of established dogma and ritual. Modern deists hold a wide range of views on the nature of God and God's relationship to the world. The common area of agreement is the desire to use reason, experience, and nature as the basis of belief. There are a number of subcategories of modern deism, including monodeism (this being the default standard concept of deism), polydeism, pandeism, spiritual deism, process deism, Christian deism, scientific deism, and humanistic deism. Some deists see design in nature and purpose in the universe and in their lives (Prime Designer). Others see God and the universe in a co-creative process (Prime Motivator). Some deists view God in classical terms and see God as observing humanity but not directly intervening in our lives (Prime Observer), while others see God as a subtle and persuasive spirit who created the world, but then stepped back to observe (Prime Mover). Beym. Plinius, den man, wo nicht Spinozisten, doch einen Pandeisten nennen konnte, ist Natur oder Gott kein von der Welt getrenntes oder abgesondertes Wesen. Seine Natur ist die ganze Schöpfung im Konkreto, und eben so scheint es mit seiner Gottheit beschaffen zu seyn. In the 1960s, theologian Charles Hartshorne scrupulously examined and rejected both deism and pandeism (as well as pantheism) in favor of a conception of God whose characteristics included "absolute perfection in some respects, relative perfection in all others" or "AR", writing that this theory "is able consistently to embrace all that is positive in either deism or pandeism", concluding that "panentheistic doctrine contains all of deism and pandeism except their arbitrary negations". Many classical deists were critical of some types of prayer. For example, in Christianity as Old as the Creation, Matthew Tindal argues against praying for miracles, but advocates prayer as both a human duty and a human need. Some contemporary deists[who?] believe (with the classical deists) that God has created the universe perfectly, so no amount of supplication, request, or begging can change the fundamental nature of the universe. Some deists[who?] believe that God is not an entity that can be contacted by human beings through petitions for relief; rather, God can only be experienced through the nature of the universe. Most deists do not believe in divine intervention, but still find value in prayer as a form of meditation, self-cleansing, and spiritual renewal. Such prayers are often appreciative (that is, "Thank you for ...") rather than supplicative (that is, "Please, God, grant me ..."). Some deists practice meditation and make frequent use of affirmative prayer, a non-supplicative form of prayer that is common in the New Thought movement. Charles Taylor, in his 2007 book A Secular Age, showed the historical role of deism, leading to what he calls an exclusive humanism. This humanism invokes a moral order, whose ontic commitment is wholly intra-human, with no reference to transcendence. One of the special achievements of such deism-based humanism is that it discloses new, anthropocentric moral sources by which human beings are motivated and empowered to accomplish acts of mutual benefit. This is the province of a buffered, disengaged self, which is the locus of dignity, freedom and discipline, and is endowed with a sense of human capability. According to Taylor, by the early 19th century this deism-mediated exclusive humanism developed as an alternative to Christian faith in a personal God and an order of miracles and mystery. Some critics of deism have accused adherents of facilitating the rise of nihilism. ^ "Deist – Definition and More from the Free Merriam-Webster Dictionary". Merriam-webster.com. 2012. Retrieved 2012-10-10. ^ "Deism". Jewish Encyclopedia. 1906. Retrieved 2012-10-10. DEISM: A system of belief which posits God's existence as the cause of all things, and admits its perfection, but rejects Divine revelation and government, proclaiming the all-sufficiency of natural laws. ^ Thomsett, Michael C. (2011). Heresy in the Roman Catholic Church: A History. McFarland. p. 222. ISBN 978-0-7864-8539-0. Retrieved 2013-05-16. ^ a b Wilson, Ellen Judy; Reill, Peter Hanns (2004). Deism. Infobase Publishing. pp. 146–148. ISBN 978-0-8160-5335-3. Retrieved 2013-05-16. ^ Hardwick, J. "Modern Deism". J. Hardwick. Retrieved 23 September 2012. ^ James W. Sire (2009). The Universe Next Door: A Basic Worldview Catalog. InterVarsity Press. pp. 59–64. ^ a b Justo L. González (1984). The Reformation to the present day. HarperCollins. p. 190. ISBN 978-0-06-063316-5. Retrieved 2010-08-14. ^ Joseph C. McLelland; Canadian Corporation for Studies in Religion (November 1988). Prometheus rebound: the irony of atheism. Wilfrid Laurier Univ. Press. p. 85. ISBN 978-0-88920-974-9. Retrieved 2010-08-14. ^ James E. Force; Richard Henry Popkin (1990). Essays on the context, nature, and influence of Isaac Newton's theology. Springer. p. 43. ISBN 978-0-7923-0583-5. Retrieved 2010-08-14. ^ "Deism Defined". Moderndeism.com. Archived from the original on 2012-07-19. Retrieved 2012-09-25. ^ Viret, Pierre (1564). Instruction Chrétienne en la doctrine de la foi et de l'Évangile (Christian teaching on the doctrine of faith and the Gospel). Viret wrote that a group of people believed, like the Jews and Turks, in a God of some kind - but regarded the doctrine of the evangelists and the apostles as a mere myth. Contrary to their own claim, he regarded them as atheists. See the Dictionary of the History of Ideas online, "Deism"
^ a b Willey, Basil (1934). The Seventeenth Century Background: Studies in the Thought of the Age in Relation to Poetry and Religion. ^ Stephen, Leslie (1881). History of English Thought in the Eighteenth Century 3rd Edition 2 vols (reprinted 1949). London: Smith, Elder & Co. ISBN 978-0844614212. Stephen’s book, despite its “perhaps too ambitious” title (preface, Vol.I p.vii), was conceived as an “account of the deist controversy” (p.vi). Stephen evidently regards this as entirely post-dating Locke. The “constructive” and “critical” aspects are treated in Chapters III and IV: the terms appear in the chapter titles. Stephen also notes the difficulty of interpreting the primary sources, as religious toleration was yet far from complete in law, and entirely not a settled fact in practice (Ch.II s.12): deist authors “were forced to .. cover [their opinions] with a veil of decent ambiguity.” He writes of deist books being burned by the hangman, mentions the Aikenhead blasphemy case (1697) , and names five deists who were banished, imprisoned etc. ^ Gay (Fröhlich), Peter Joachim, ed. (1968). Deism: An Anthology. Princeton etc: Van Nostrand. ISBN 978-0686474012. ^ Waring, Edward Graham (1967). Deism and Natural Religion: A Source Book. F. Ungar Pub. Co. Introduction, p. xv. Retrieved 2013-05-16. One of the remarkable features of deism is that the critical elements did not overpower the constructive elements: "A strange feature of the [Deist] controversy is the apparent acceptance of all parties of the conviction of the existence of God." ^ For example Tindal: "By natural religion, I understand the belief of the existence of a God, and the sense and practice of those duties which result from the knowledge we, by our reason, have of him and his perfections; and of ourselves, and our own imperfections, and of the relationship we stand in to him, and to our fellow-creatures; so that the religion of nature takes in everything that is founded on the reason and nature of things." Christianity as Old as the Creation (II), quoted in Waring (see above), p.113. ^ Champion, J.A.I. (2014). The Pillars of Priestcraft Shaken: The Church of England and its Enemies, 1660-1730. Cambridge University Press (Cambridge Studies in Early Modern British History). Champion maintains that historical argument was a central component of the deists' defences of what they considered true religion. ^ “It can't be imputed to any defect in the light of nature that the pagan world ran into idolatry, but to their being entirely governed by priests, who pretended communication with their gods, and to have thence their revelations, which they imposed on the credulous as divine oracles. Whereas the business of the Christian dispensation was to destroy all those traditional revelations, and restore, free from all idolatry, the true primitive and natural religion implanted in mankind from the creation.” Christianity as Old as the Creation (XIV), quoted in Waring (see above), p.163. ^ David Hartley, for example, described himself as "quite in the necessitarian scheme. See Ferg, Stephen, "Two Early Works of David Hartley", Journal of the History of Philosophy, vol. 19, no. 2 (April 1981), pp. 173–89. ^ See for example Liberty and Necessity (1729). ^ Orr. (see above). p.134. ^ Orr. (see above). p.78. ^ Orr. (see above). p.137. I trouble not myself about the manner of future existence. I content myself with believing, even to positive conviction, that the power that gave me existence is able to continue it, in any form and manner he pleases, either with or without this body; and it appears more probable to me that I shall continue to exist hereafter than that I should have had existence, as I now have, before that existence began. ^ Michael E. Eidenmuller. "Benjamin Franklin – Constitutional Convention Address on Prayer". Americanrhetoric.com. Retrieved 2010-09-27. ^ The discussion of the background of deism is based on the excellent summary in "The Challenge of the Seventeenth Century" in The Historical Jesus Question by Gregory W. Dawes (Westminster: John Knox Press, 2001). Good discussions of individual deist writers can be found in Basil Willey’s The Seventeenth Century Background (see above) and The Eighteenth Century Background: Studies on the Idea of Nature in the Thought of the Period (1940). ^ Lan, Feng (2005). Ezra Pound and Confucianism: remaking humanism in the face of modernity. University of Toronto Press. p. 190. ISBN 978-0-8020-8941-0. ^ a b Orr. (see above). Herbert’s list of these Notions is quoted at p.62. No general agreement exists concerning the Gods, but there is universal recognition of God. Every religion in the past has acknowledged, every religion in the future will acknowledge, some sovereign deity among the Gods. .. Accordingly that which is everywhere accepted as the supreme manifestation of deity, by whatever name it may be called, I term God. While there is no general agreement concerning the worship of Gods, sacred beings, saints, and angels, yet the Common Notion or Universal Consent tells us that adoration ought to be reserved for the one God. Hence divine religion — and no race, however savage, has existed without some expression of it — is found established among all nations. .. The connection of Virtue with Piety, defined in this work as the right conformation of the faculties, is and always has been held to be, the most important part of religious practice. There is no general agreement concerning rites, ceremonies, traditions .. ; but there is the greatest possible consensus of opinion concerning the right conformation of the faculties. .. Moral virtue .. is and always has been esteemed by men in every age and place and respected in every land. .. There is no general agreement concerning the various rites or mysteries which the priests have devised for the expiation of sin. .. General agreement among religions, the nature of divine goodness, and above all conscience, tell us that our crimes may be washed away by true penitence, and that we can be restored to new union with God. .. I do not wish to consider here whether any other more appropriate means exists by which the divine justice may be appeased, since I have undertaken in this work only to rely on truths which are not open to dispute but are derived from the evidence of immediate perception and admitted by the whole world. The rewards that are eternal have been variously placed in heaven, in the stars, in the Elysian fields .. Punishment has been thought to lie in metempsychosis, in hell, .. or in temporary or everlasting death. But all religion, law, philosophy, and .. conscience, teach openly or implicitly that punishment or reward awaits us after this life. .. [T]here is no nation, however barbarous, which has not and will not recognise the existence of punishments and rewards. That reward and punishment exist is, then, a Common Notion, though there is the greatest difference of opinion as to their nature, quality, extent, and mode. It follows from these considerations that the dogmas which recognize a sovereign Deity, enjoin us to worship Him, command us to live a holy life, lead us to repent our sins, and warn us of future recompense or punishment, proceed from God and are inscribed within us in the form of Common Notions. Revealed truth exists; and it would be unjust to ignore it. But its nature is quite distinct from the truth [based on Common Notions] .. [T]he truth of revelation depends upon the authority of him who reveals it. We must, then, proceed with great care in discerning what actually is revealed. .. [W]e must take great care to avoid deception, for men who are depressed, superstitious, or ignorant of causes are always liable to it. ^ Orr. (see above). p.59ff. ^ Waligore, Joseph (2012). "The Piety of the English Deists". Intellectual History Review. 22 (2): 181–197. doi:10.1080/17496977.2012.693742. Waligore mentions Herbert’s account (Herbert, The Life of Edward Lord Herbert of Cherbury (Dublin, 1771), 244–245) in which he states he “prayed "I am not satisfied enough whether I shall publish this Book, De Veritate; if it be for Thy glory, I beseech Thee give me some Sign from Heaven, if not, I shall suppress it" and recounts that the response was "a loud tho' yet gentle Noise came from the Heavens (for it was like nothing on Earth). .. I had the Sign I demanded. "” (p.189) Waligore argues that instead of saying Herbert was not a deist, we should change our notions about the deists and their relationship to God through prayer. ^ Orr. (see above). pp.96-99. ^ "Deism | religious philosophy". Encyclopedia Britannica. Retrieved 2017-09-27. ^ Gay. (see above). Gay describes him (pp.78-79) as "a Deist in fact, if not in name". ^ Waring. (see above). p.107. ^ Russell, Paul (2005). "Hume on Religion". Stanford Encyclopedia of Philosophy. Retrieved 2009-12-17. ^ Orr. (see above). p.173. ^ Gay. (see above). p.140. ^ "Excerpts from Allen's Reason The Only Oracle Of Man". Ethan Allen Homestead Museum. Archived from the original on 2008-05-02. Retrieved 2008-05-01. ^ "Culture Wars in the Early Republic". Common-place. Archived from the original on 2014-03-02. ^ Walters, Kerry S. (1992). Rational Infidels: The American Deists. Durango, CO: Longwood Academic. ISBN 0-89341-641-X. ^ "The Deist Minimum". First Things. 2005. ^ Holmes, David (2006). The Faiths of the Founding Fathers. New York, NY: Oxford University Press, USA. ISBN 0-19-530092-0. ^ David Liss (11 June 2006). "The Founding Fathers Solving modern problems, building wealth and finding God". Washington Post. ^ Walter Isaacson (March–April 2004). "Benjamin Franklin: An American Life". Skeptical Inquirer. Archived from the original on 2007-10-12. ^ Franklin, Benjamin (2005). Benjamin Franklin: Autobiography, Poor Richard, and Later Writings. New York, NY: Library of America. p. 619. ISBN 1-883011-53-1. ^ "Benjamin Franklin, Autobiography". University of Maine, Farmington. Archived from the original on 2012-12-10. ^ Benjamin Franklin, On the Providence of God in the Government of the World (1730). ^ Max Farrand, ed. (1911). The Records of the Federal Convention of 1787. 1. New Haven: Yale University Press. p. 451. ^ Frazer, Gregg L. (2012). The Religious Beliefs of America's Founders: Reason, Revelation, Revolution. University Press of Kansas. p. 11. ^ Ahlstrom, Sydney E. (2004). A Religious History of the American People. p. 359. ^ Frazer, Religious Beliefs of America's Founders, p. 128 quoting Jefferson's Notes on the State of Virginia, 1800 ed., p. 164. ^ Other scholars call Jefferson a "theistic rationalist" (although that term was coined later), such as Gary Scott Smith (2006). Faith and the Presidency: From George Washington to George W. Bush. Oxford U.P. p. 69. ISBN 9780198041153. ^ a b c "English Deism". The Internet Encyclopedia of Philosophy. 2006. Retrieved 2009-12-16. ^ a b c d e f Mossner, Ernest Campbell (1967). "Deism". Encyclopedia of Philosophy. 2. Collier-MacMillan. pp. 326–336. ^ "Raymond Fontaine's website: From Catholic Priest to Deist With Nature's God". deism.com. ^ "ARIS key findings, 2001". Archived from the original on 2005-10-24. ^ "ARIS Summary Report, March 2009" (PDF). 2009. Retrieved 2017-03-18. ^ "Deism and Reason". Sullivan-county.com. Retrieved 2010-09-27. ^ Große, Gottfried (1787). Naturgeschichte: mit erläuternden Anmerkungen. p. 165. ^ Moritz Lazarus and Heymann Steinthal, Zeitschrift für Völkerpsychologie und Sprachwissenschaft (1859), p. 262. ^ Hartshorne, Charles (1964). Man's Vision of God and the Logic of Theism. p. 348. ISBN 0-208-00498-X. ^ "External link to portion of text". Archived from the original on 2007-02-09. Retrieved 2007-01-11. ^ "Deism Defined, Welcome to Deism, Deist Glossary and Frequently Asked Questions". Deism.com. 2009-06-25. Retrieved 2010-09-27. ^ Lockard, Jim. "Affirmative Prayer". Affirmative Prayer. Affirmative Prayer. Retrieved 31 July 2018. ^ Taylor, C (2007). A Secular Age. Cambridge, Massachusetts: Harvard University Press. p.256. ^ Taylor. (see above). p.257. ^ Taylor. (see above). p.262. ^ Essien, Anthonia M. "The sociological implications of the worldview of the Annang people: an advocacy for paradigm shift." Journal of Emerging Trends in Educational Research and Policy Studies 1.1 (2010): 29-35. Look up deism in Wiktionary, the free dictionary. Hazard, Paul. European thought in the eighteenth century from Montesquieu to Lessing (1954). pp 393-434. Herrick, James A. (1997). The Radical Rhetoric of the English Deists: The Discourse of Skepticism, 1680–1750. U of South Carolina Press. Hudson, Wayne. Enlightenment and modernity: The English deists and reform (Routledge, 2015). Israel, Jonathan I. Enlightenment contested: philosophy, modernity, and the emancipation of man 1670-1752 (Oxford UP, 2006). Lemay, J. A. Leo, ed.Deism, Masonry, and the Enlightenment. Essays Honoring Alfred Owen Aldridge. (U of Delaware Press, 1987). Lucci, Diego. Scripture and deism: The biblical criticism of the eighteenth-century British deists (Peter Lang, 2008). Schlereth, Eric R. An Age of Infidels: The Politics of Religious Controversy in the Early United States (U of Pennsylvania Press; 2013) 295 pages; on conflicts between deists and their opponents. Yoder, Timothy S. Hume on God: Irony, deism and genuine theism (Bloomsbury, 2008). Paine, Thomas (1795). The Age of Reason.